The Nurse shark is sometimes called the « Nebrius ferrugineus » or the ma’o rohoi in the Tahitian language. It measures up to 10,5ft and weighs around 220lbs at adulthood. The Nurse shark often lives on the sandy sea bottoms. This sedentary shark lives quietly as deep as 230ft. It has a massive and flat body, grey brown color on the back and a white color on the belly side. One of its main characteristic is its ability to slightly change its body color depending to the surrounding environment without even having the chameleon’s capability of camouflage. The Nurse shark possesses many characteristics enabling us to better identify this species. It possesses 2 almost identical dorsal fins. It also has a large tail and a muzzle with a pair of sensory feelers called ‘barbels’ like that of a catfish. These barbels are comparable to a moustache and offer a well-developed sense of smell. Sometimes called the « Nebrius ferrugineus » or the ma’o rohoi in the Tahitian language. 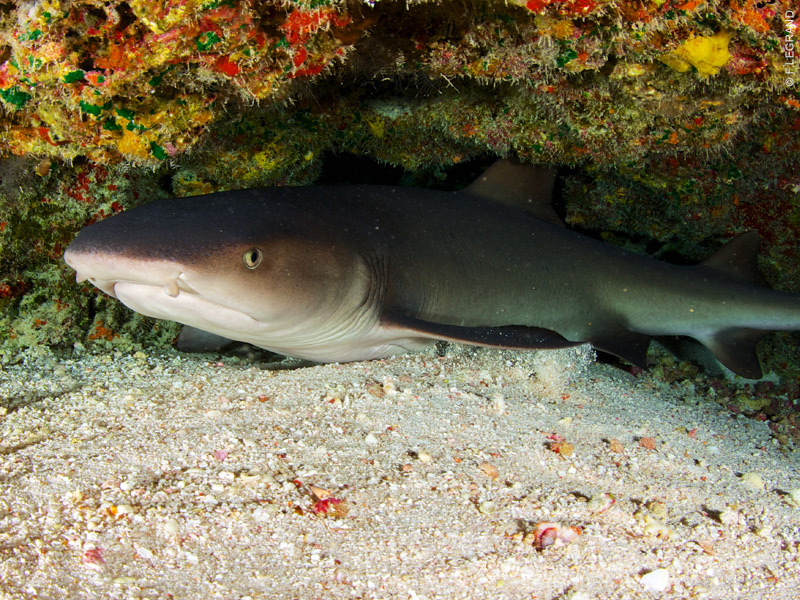 The Nurse shark is considered as a noctural species; it sleeps during the day in the shadows of small coral cavities and hunts after nightfall. The shark feeds and forages on cephalopods, small fish, crustaceans and other sea urchins. It is capable of producing a blowing or sucking in motion through the mouth to catch its prey. Moreover, its name comes from the sound comparable to that of an infant’s suckling. Its geographical habitat is the Red Sea, the Tuamotu Archipelago, and the South of Japan or near New Caledonia. It becomes sexually mature after reaching a size of 6 to 10ft. Male and female meet up in underwater caves. Like many sharks, the Nurse shark is ovoviparous; i.e. the eggs develop and hatch safely inside the female’s body. Each litter is usually composed of 4 small sharks of about 15 inches. It has a reputation of being inoffensive but it may become aggressive if annoyed. Nowadays, the Nurse shark is considered as a vulnerable species. Indeed, it is confronted with a real risk of extinction. You can encounter the Nurse shark around the coral reefs lying on the sandy bottom in most of the islands of French Polynesia.